Michael Lewis, in his 2011 book “Boomerang” on the consequences of the financial crisis, said that “leverage buys you a glimpse of a prosperity you haven’t earned”. Well, if that is true, we are all in trouble based upon the findings from the fascinating Geneva report “Deleveraging? 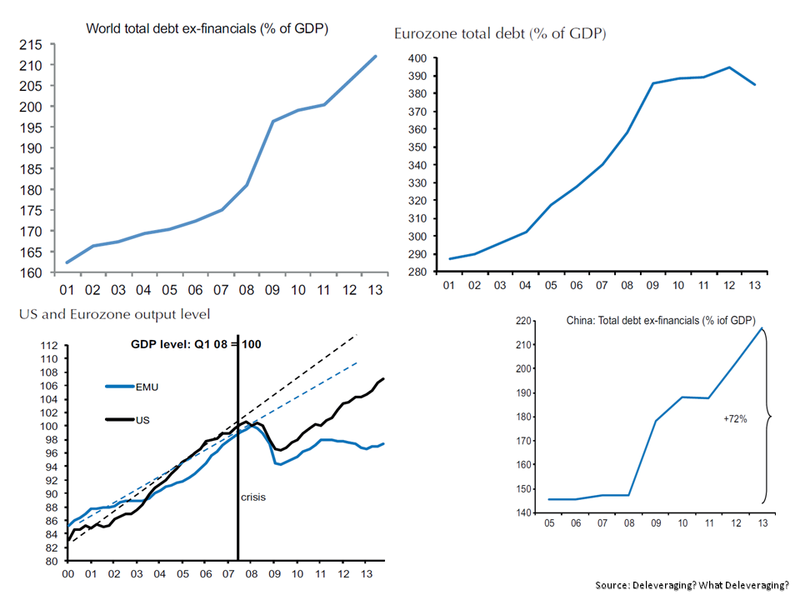 What Deleveraging?” from Luigi Buttiglione, Philip Lane, Lucrezia Reichlin and Vincent Reinhart, published yesterday. The report has a number of attention grabbing graphs on debt levels as a % of GDP like the one below on the US and others on Europe, China and global debt levels, as below. The report is particularly pessimistic about China’s medium term prospects after its rapid 72% rise in debt levels since the crisis. On the US and the UK, for the countries who “managed the trade-off between deleveraging policies and output costs better so far, by avoiding a credit crunch while achieving a meaningful reduction of debt exposure of the private sector and the financial system” the legacy of “a substantial re-leveraging of the public sector, including the central banks” leaves a considerable challenge for the future. This entry was posted in Economics and tagged Boomerang, China, credit crunch, deleveraging and slower nominal growth, Deleveraging What Deleveraging, Geneva report, global capacity, global debt to GDP, leverage, Lucrezia Reichlinm, Luigi Buttiglione, Michael Lewis, private sector, public sector, re-leveraging, real output and lower inflation, Vincent Reinhart, world growth and inflation. Bookmark the permalink. The only thing that really surprises me is how well the UK is doing. I thought they would have a harder time given their lopsided economy but obviously I was wrong. The whole deleveraging theme develops pretty much according to the script I would see (Richard Koo’s favorite topic for the last couple of years). Since not all parties in an economy can deleverage at the same time households and to some extent corporates (although we have seen some significant re-leveraging at the large corps lately) go ahead, the government picks up the tab. At some point in the future inflation, higher taxes and potentially capital controls in some way (read: financial repression) will take care of that. 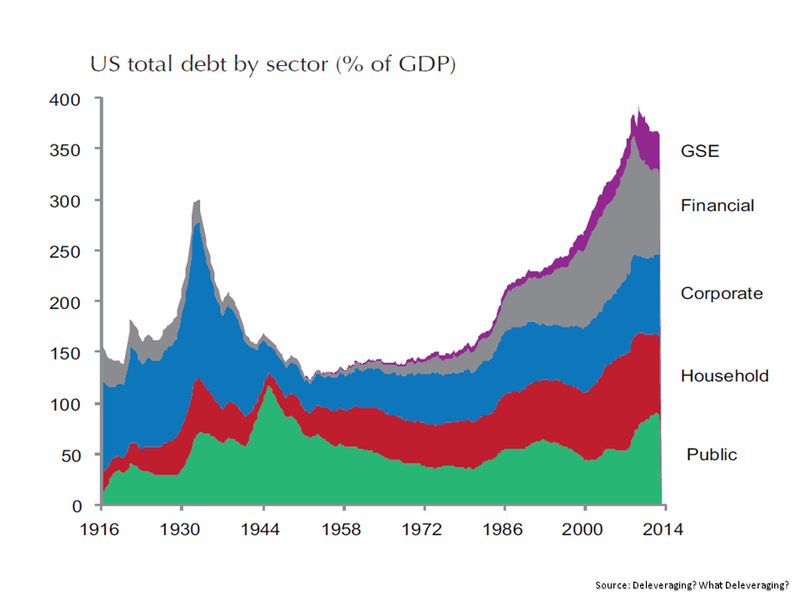 Basically the way the US got rid of their WWII debt… iirc it lasted until the mid 1970s (cf Reinhart and Rogoff, R&R). R&R argued that it takes about a decade to overcome a housing bubble induced crisis. Which would mean that we are about halfway trough it, ie one more bear/ bull cycle to go (methinks that we are reasonably close to the beginning of the next bear market, maybe a few more months to go, but that’s a different story). Regarding China, from what I read and see this might be the big grey swan in the room. Not doomed to fail for sure, the administration there did a very decent job so far balancing the economy. Whether they can continue to pull off their stunts remains to be seen. The housing market seems to be in doldrums (US in 2007 anyone ?) and corporate balance sheets seem not to be overly robust either. Throw in non-performing loans and under-performing SOEs and you have a handful of candidates that might derail the fragile recovery. I think the next 12 months might become rather interesting. I don’t quite know what to think about China, a lot of scary stuff about their debt. I have read Koo’s thinking around a balance sheet recession in the FT and also read something from BoA/Merrill about how China is where Japan was 30 years ago! Then somebody like the lady from DE Shaw at the back of the deleveraging report cautioning against being too pessimistic on China. Let me know if you have any recommendations on articles/reports on China, I am just so wary about stats from China. Nonetheless, too much debt all around and that’s not good. Will be interesting to see how current market sentiment plays out, my guess is volatile & down 5%-10% over next few weeks and than back up for year-end, absence any major geopolitical events!!! I read another more optimistic piece lately but don’t have it at hand. Let me see whether I can pull it out next week. I used to think that it is all gloom and doom but on the other hand the government managed to balance the economy quite well so far so there might be hope. Re China vs Japan: Dunno honestly. What scares me more is old Europe with its nasty combination of high debt, low growth and political incompetence/ inability/ unwillingness. This reminds me of Japan two decades ago… mind that they haven’t sorted out their political issues until now (eg labor market, pensions). Wait and see :-). What makes me a bit pessimistic is the combination of John Hussman calling for a crash (not just warning that the situation is fragile but explicitly saying that conditions now mirror those of late 2000 and mid 2007) and some traders who are not uberbears also looking to the downside (ie long term and short term views converging). USDJPY will be interesting to watch going forward… a further devaluation might kickstart the Japanese export machine. Looks like Buttonwood also picked up said report: http://www.economist.com/blogs/buttonwood/2014/10/monetary-policy-economy-and-markets.